Do you really need a sound card for gaming? Probably not for most of the gamers because onboard audio on motherboards has become so much better these days that you can have an enjoyable gaming experience on it. Integrated audio solution is also good enough for listening music, watching movies and even for an average HTPC setup. Most of the computer users don’t buy sound these days because of this tremendous improvement of the quality of onboard audio chips. The most common integrated sound chip or chipset used in almost all the motherboards is Realtek and it provides up to High Definition (HD) audio and 7.1 channel sound setup in most of the motherboards. However, if you are an audiophile, music enthusiast, enthusiast gamer or a professional whose job involves music or sound recording, testing or playback then you do need a good dedicated sound card. A good dedicated sound card is still way ahead of the onboard sound, no matter how better onboard audio has become in recent times. An audiophile or a music enthusiast can easily tell difference between the quality of a dedicated sound card and an integrated sound solution. If you have high-end speakers (5.1 or 7.1 channel) or high impedance audiophile headphones such as Beyerdynamic DT990 PRO, Audeze LCD-3 or Pioneer SE-MASTER1 then you can’t get the most out of them by using integrated audio, as their true quality and higher volume can only be experienced with a good dedicated sound card equipped with a headphone amplifier. Also, if you have an older computer with crappy onboard sound or your PC integrated sound is damaged or not supported by an upgraded version of Operating System then even a budget internal sound card comes in very handy and can make your PC sing again. A dedicated sound card offers you much better audio quality, almost no interference from electronic components, higher SNR ratio, better DAC, supports advanced features and have much better drivers and software package designed for professional use. 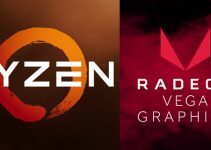 So, here in this post I am going to list down the best sound cards for PC that can provide you an amazing audio quality and richer sound experience for gaming and music. I will also list down the best external sound cards for laptops so that laptop users won’t feel left out. Important Tip: Disable your onboard sound in the BIOS when using an internal sound card to avoid any compatibility and other issues. 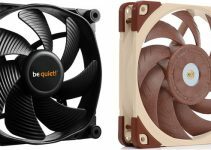 Here are the best budget sound cards that can serve as an integrated audio replacement or if you want better sound from an older computer or for motherboards with no onboard or damaged integrated sound. Creative is one of the most popular and widely known manufacturer of sound cards. It is also recognized for its other audio products that include speakers, headphones, amplifiers and gaming headsets. Here we have Creative Sound Blaster Audigy Fx which is a 5.1 channel sound card powered by SBX Pro Studio technology. This is a half-height or low profile sound card that can also be used in low profile or slim form factor PC cases using the half-height bracket that comes bundled with it. 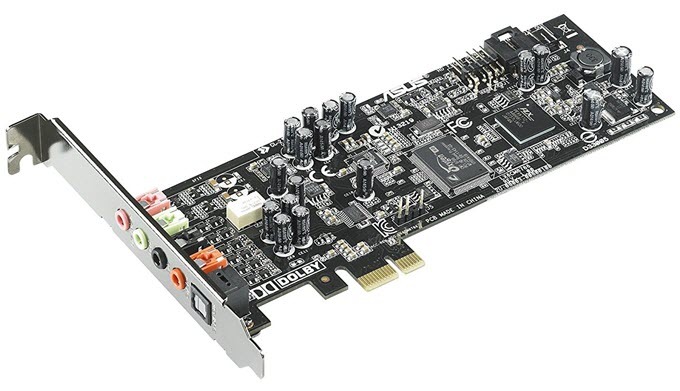 This sound card works on PCI-Express slot ((PCIe x1) and also has connector for front panel audio. The sound card has SNR ratio of 106 dB and can deliver up to 600 ohms of power for high impedance studio grade headphones. It comes with five 3.5mm jacks, where two are for input and three are for output. It also features a 24-bit 192kHz digital-to-analog converter for playback. It comes with Sound Blaster Audigy Fx Control Panel from where you can manage and tweak all the advanced settings (SBX Pro Studio settings). The sound card also offers decent recording quality. It is officially compatible with Windows 10 operating system and you can download the latest drivers from the Creative website. Overall, it is one of the best budget low profile sound cards that serves as a good alternative to integrated sound card and for use in HTPC. Another low profile sound card but this one is from Asus. Asus Xonar DGX is a 5.1 channel sound card that offers SNR of 105 dBA and high-resolution audio at 96KHz/24bit. The card is very similar to the above-mentioned Creative Sound Blaster Audigy Fx both in terms of performance and features. The card comes with SPDIF Out port (Optical) that lets you connect audio devices, equipment or headsets that uses S/PDIF connection or interface. It also comes with Built-in Headphone AMP for connecting low power to high power headphones. It has got 3 headphone AMP gain modes for different usage scenarios that include VOIP, pro-gaming, exciter. This is quite a feature rich sound card that comes with ASUS’s exclusive GX2.5 gaming audio engine for realistic 3D audio effects. It also comes with onboard connector for connecting front panel audio. The sound card comes with low profile bracket for use in slim PC cases. This is a PCIe sound card but it also comes in PCI version (Asus Xonar DG) with same specifications for use on older motherboards that lacks PCI-Express slot. You can check out both these models from the link given below. 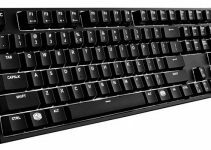 It is compatible with Windows 10 / 8.1 / 8 / Vista / XP operating systems both 32-bit and 64-bit variants. Also, it is said to be compatible with most of the Linux variants but you have to contact Asus support for complete clarification. 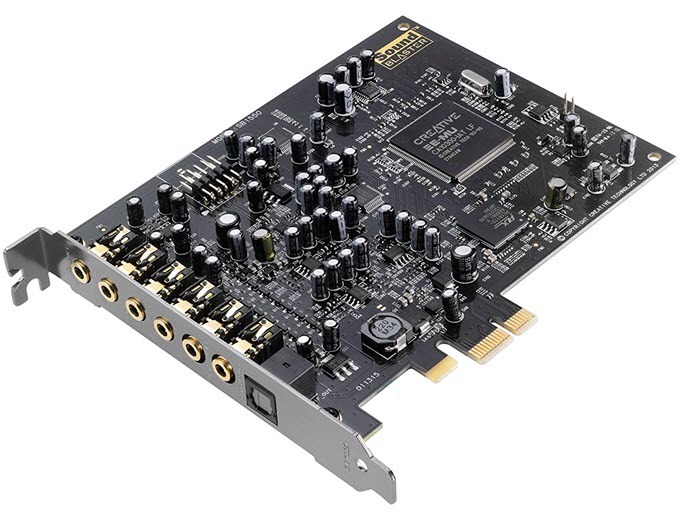 Creative Sound Blaster Audigy Rx is a budget 7.1 channel sound card with Creative E-MU chipset. This PCI Express sound card has SNR of 106 dB and offers High Definition HD Audio at 24-bit / 192kHz. It comes with optical out port (TOSLINK) for an amazing audio experience through digital audio signals. It also comes with dual microphone inputs for dual recording simultaneously. The Creative E-MU chipset used in this sound card supports EAX (Environmental Audio eXtensions) and deliver amazing cinematic audio playback effects without putting load on your CPU. For audiophiles, it comes with 600-ohm headphone amplifier which means you can use high-impedance headphone with it flawlessly. It comes bundled with its own recording software such as Creative WaveStudio and Creative Smart Recorder. The sound card is capable of generating super low latency recordings having high quality. The control panel and EAX Studio software that comes with this sound card allows you fine tune various settings and can adjust all of the EAX Advanced HD settings such as adding environmental effects to your music, movies and games, or change the key of your music on the fly to match your voice. It also includes connector for use with front panel audio ports of your PC. The sound card supports Windows operating systems from XP SP2 to Windows 10. Overall, a good 7.1 channel sound card that is better than 7.1 channel integrated audio and you can use it for gaming, HTPC and for high quality music playback. Below are the best sound cards for gaming and for audiophiles. These sound cards can also be used for recording audio at decent quality but they are best for audio playback. 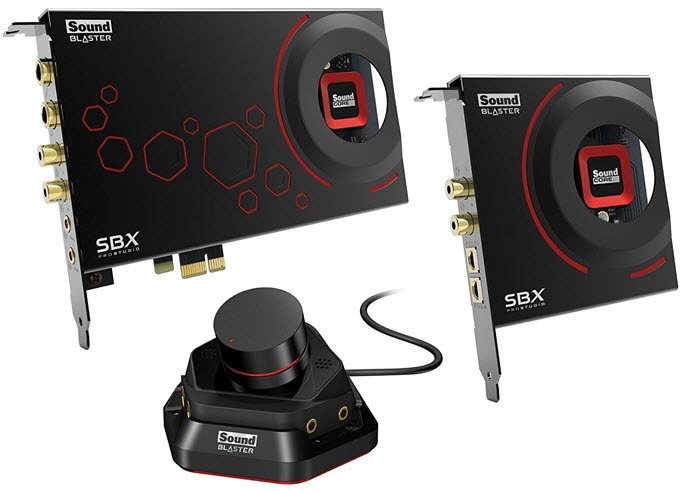 Sound Blaster Z is a PCIe gaming grade sound card from Creative. It is a part of the ultra high-performance Z-Series of Sound Blaster sound card. The sound card comes with Sound Blaster Beamforming Microphone for crystal clear voice communication as its CrystalVoice Focus technology eliminates outside noise & echoes, so that the receiving or communicating person can hear your voice with great clarity. It is powered by Sound Core3D audio processor that offloads your CPU from SBX Pro Studio and CrystalVoice effects processing so that the performance of your PC does not suffer. This is a stylish and good looking sound card with red cover on it and you can see the sound processor through a transparent round section on its middle. This is a 5.1 channel sound card that comes with optical in/out ports along with one mic-in 3.5mm jack. It has got high SNR of 116 dB and delivers superior HD Audio quality at 24-bit / 192kHz. It supports Dolby Digital Live and SBX Pro Studio technologies to create amazing 3D sound effects. The sound card is also capable of recording audio at low latencies for your content creation. It supports up to 600 Ohm headphones and you can easily switch between headphones and speakers from the Creative’s software control panel without having to unplug them physically. It does come with Front panel audio connector but it is only compatible with standard Intel HD Front Panel Audio connection. It fully supports Windows 10, 8 and 7 operating systems but is not compatible with Linux. The sound card is also available with Audio Control module (ACM) having built-in microphone array and mic/headphone I/O connections and a knob on the ACM to adjust the headphone levels. You can check out both these models from the links given below. 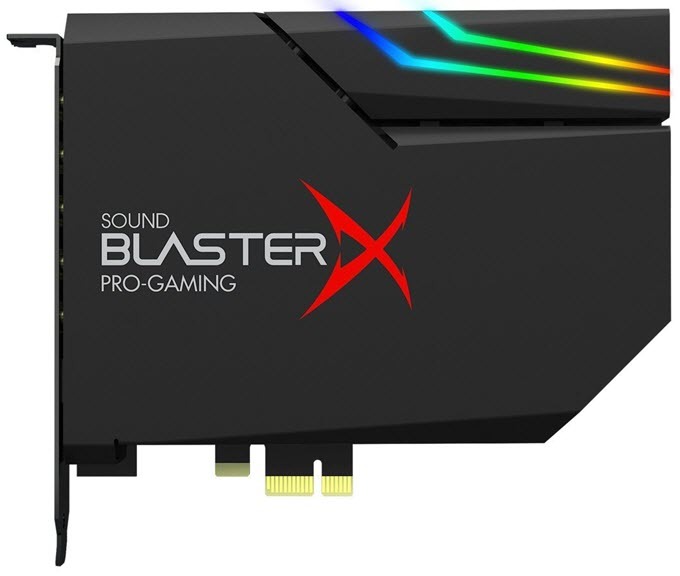 Sound BlasterX AE-5 is a high-end PCIe Gaming Sound Card. It is even better and fancier than the above mentioned Sound Blaster Z sound card. This gaming sound card comes with RGB LED Lighting which is rarely seen in sound cards. The sound offers excellent audio clarity and quality at 122 dB SNR and 24-bit / 192kHz. It features Xamp which is a discrete headphone amplifier and can drive 16 – 600 Ohm headphones with high audio clarity. This is a 5.1 channel sound card and supports Dolby Digital. The SABRE32 Ultra Class DAC on this sound card deliver up to 32-bit 384kHz playback with ultra-low distortion and jitter. This is a perfect sound card for audiophiles, gaming and for movies. For RGB lighting it requires power from the 4-pin molex connector from the PSU. The Scout Mode when activated on this sound card gives you a tactical advantage over enemies by pinpointing their location using footsteps and weapon switching sounds. Other features include BlasterX Acoustic Engine, CrystalVoice technology and Front audio header. The OS supported by this sound card includes Windows 7, Windows 8, Windows 8.1, Windows 10. This gaming sound card is also available in special white edition with three more LED strips. You can check both black and white models from the links given below. 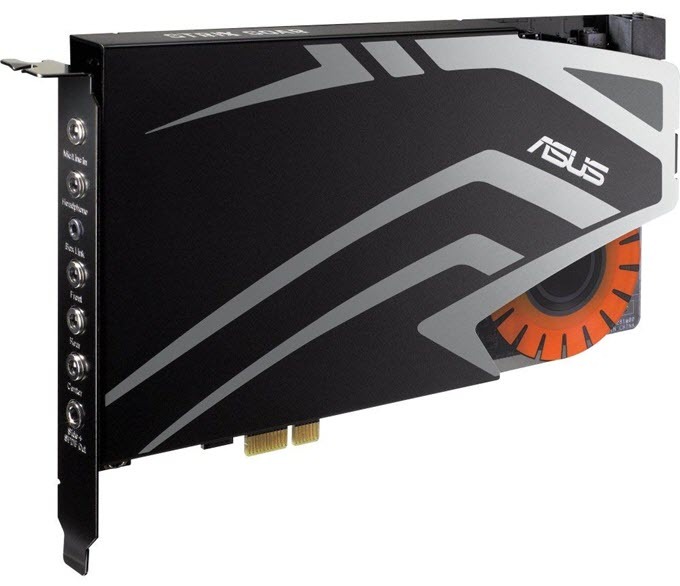 ASUS STRIX SOAR is a 7.1 Channel PCIe Gaming Sound Card that offers 116dB SNR and HD Audio to up to 24-bit / 192kHz. The sound card comes with Sonic Studio software that allows you to fine tune and adjust various audio settings and effects. It has got 600 ohm headphone amplifier for using high-impedance headphones. 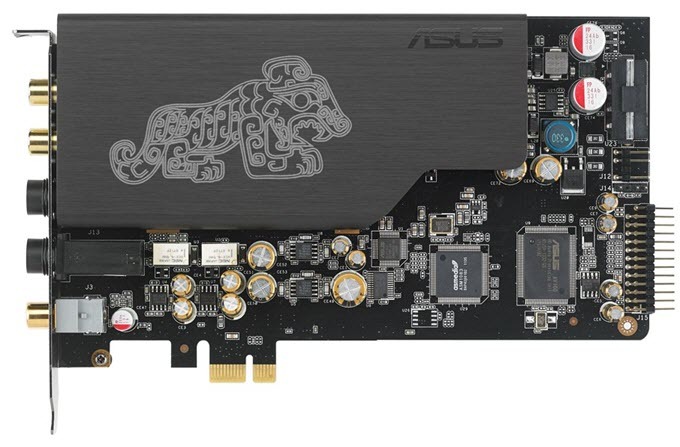 The sound card does look like a single slot graphics card because of its top cover with semi-circular owl-eye design lighting on the bottom side of the card. Also, it requires a 6-pin PCI-Express power connector from the PSU for its working. For gaming, it comes with Sonic Radar Pro feature that allows you pinpoint your enemies and opponents via Sonic Radar. The sound card is powered by C-Media USB2.0 6632AX High-Definition Sound Processor and officially supports Windows 10. Overall, a decent gaming sound card for the money. Here are the best sound cards for audiophiles for having great music and audio experience. These are high-fidelity sound cards that offers higher SNR and superb audio clarity. These sound cards are also good for audio or music recording. If you are an audiophile or music enthusiast then you will love this sound card. Asus Essence STX II is a high-fidelity sound card that delivers industry leading SNR of 124 dB for superior audio clarity and offers high-resolution HD audio at 24-bit / 192kHz. The sound card is powered by ASUS AV100 High-Definition Sound Processor and TI Bur-Brown PCM1792A Digital-to-analog Converter (DAC). This sound card is also good for music or audio recording purpose. It uses PCIe slot to connect to your motherboard. You can connect your high-impedance headphones to it as it comes with 600-ohm headphone amplifier. The daughter board for this sound can be purchased separately for 7.1 channel true surround sound experience. Also, the daughter board has three swappable op-amp sockets for customization and creating different levels of sound effects and combinations. The sound card comes with front panel header for connecting front audio ports in your PC. The sound card is a bit on the expensive side but it is one of best sounding sound cards in the market. The software that comes with it is not that good but you can use Audacity or Goldwave audio softwares with it without any issues. Other features include Ultra-low jitter with premium TCXO clock source, high-fidelity low-dropout (LDO) regulators and WIMA capacitors and Dolby support. The sound card supports Windows 10, 8, 7, Vista and XP. Overall, it is a great sound card especially for expensive high-end and high-impedance headphones. 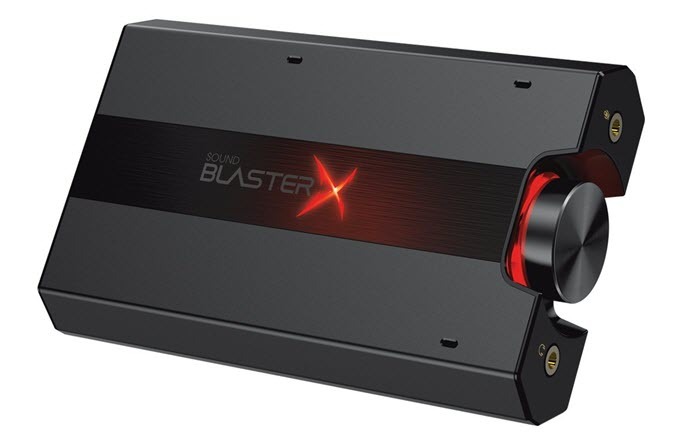 Sound Blaster ZxR is a high-fidelity sound card and is the flagship of the Sound Blaster Z-Series sound cards. This ultra high-performance sound card boasts SNR of 124 dB and superior HD sound quality to up to 24-bit / 192kHz. The sound card comes bundled with a DBPro daughter board and Audio Control Module (ACM). The daughter board comes with extra input / output ports that includes optical in/out and RCA ports. The main sound card uses PCIe slot while the daughter boards connect to main sound card using a special cable. The Audio Control module (ACM) comes with Beamforming microphone and mic/headphone I/O connections. You can control the volume of the headphone using the volume knob on the ACM. The sound card is capable of low latency recordings with excellent quality. It is powered by Sound Core3D Audio Processor that offloads SBX Pro Studio and CrystalVoice effects processing from your CPU. 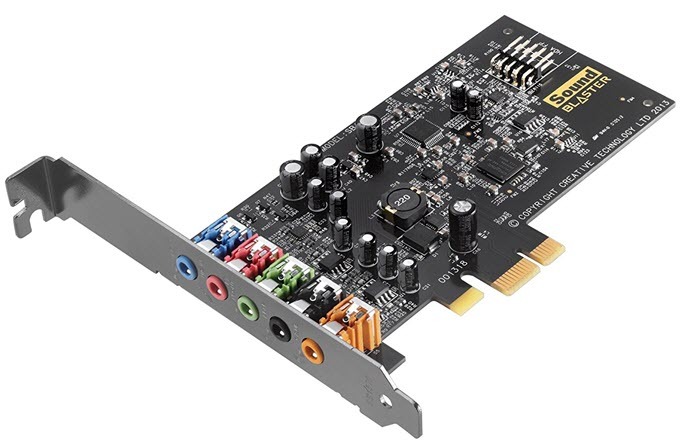 This is a 5.1 channel sound card and supports Dolby Digital / DTS connect. The sound card supports high-impedance studio quality headphones up to 600 ohm. This is one of the best sound cards for music enthusiasts, gamers and for studio grade content creation. Other features include CrystalVoice technology for removing echoes and ambient noises for crystal clear voice communication through mic., Scout mode for gaming and front panel header for PCs. The sound card officially supports Windows 10 and Windows 8 / 7. So, if you are looking for a high quality sound card with complete package then you cannot go wrong with this one. EVGA is one of the most popular graphics card manufacturers in the world, and is a premier board-partner of Nvidia. It makes high quality Nvidia graphics cards including budget, mid-range and high-end graphics cards. EVGA is also known for its PSUs or power supplies that offer good value and performance. It has now stepped into audio devices category too, and has come with a high-quality and feature rich sound card, which is EVGA Nu Sound Card. This is a premium high-fidelity sound card from EVGA that can be used for gaming, playback and for recording. The sound delivers SNR of 123dB and superior HD Audio quality to up to Up to 384kHz, 32bit (Stereo) / Up to 192kHz, 24bit (Optical) for Playback, and Up to 384kHz, 32bit (Line-in) / Up to 192kHz, 24bit (Mic-In) for Recording. It uses XMOS xCORE-200 DSP and Native DSD Support (up to x256). The sound card is built in collaboration with Audio Note (UK), Ltd. that has been in the high-end audio business for over 30 years. It uses premium Audio Grade Capacitors, Resistors and other components from Audio Note (UK), so that you get the best sound quality available. This is a 5.1 channel sound card that comes with wide range of I/O ports that include Stereo Out (RCA L/R), Headphone Out (6.3mm), Line-In (3.5mm), Mic-In (3.5mm), Optical Out (TOSLINK Passthrough) and Front Panel Header. The sound card comes with 16 – 600 ohm AMP to support high-impedance headphones. For PC connectivity, it uses PCI-E x1 slot but it has got built-in PCIe to USB controller, which makes it more of an internal audio sound card. The sound card is covered with a silver shroud and features 10 Mode RGB Lighting. The EVGA’s NU Audio software is simple to use and comes with lots of features. You can customize the various audio settings and also the RGB lighting using the software. Other features include Switchable OP-AMPs for Headphone & Line-out. The sound card needs one SATA power connector for its working and supports Windows 7 / 8.1 /10 Operating Systems. Overall, a high quality sound card for audiophiles, gamers and for professional work. Here are some high-fidelity sound cards that uses older PCI slot. They are great sounding cards especially if you pair them with high quality headphones with high impedance (up to 600 ohm). Here are best external sound cards that you can use with laptops and PC. These are USB sound cards are Plug-and-play (PnP) and they do not require your motherboard or onboard audio for their working. If your laptop integrated audio is damaged or want better audio out from your laptop then you can use these external sounds card having USB interface. You can also use them with your desktop PC if you do not wish to add a good internal sound card and don’t want to use the crappy integrated audio. P.S. – External Sound Cards are also known as Portable Sound Cards. This is one of the cheapest 7.1 channel external sound cards that you can get for your laptop or PC. This is from a brand called StarTech.com which is pretty well known for making audio / video adapters and cables. You can turn your laptop or PC into a surround sound home theatre system using this USB sound card. It connects using USB type B connector on its back and includes S/PDIF In and Out ports. The sound card uses C-Media – CM6206 chipset and deliver audio quality to up to 16-bit / 48 KHz. The sound quality of this external sound card is pretty decent for the price which it sells. On the top of the sound card you will find volume control buttons, mic and mute buttons for controlling volume of headphones or speakers. It is compatible with all version of Windows from XP to 10 (32/64-bit). Overall a cheap and easy solution for setting up a surround sound system for your computer, especially for laptops. Sound Blaster Omni Surround is high performance USB sound card that supports 5.1 Channel and offers 100 dB SNR and audio quality to up to 24-bit / 96kHz. This external sound card from Creative comes with 600 Ohm Headphone Amp for high-impedance headphones, and built-in dual microphone with beamforming technology for crystal clear voice communication. It comes with variety of connectivity options including optical out and RCA jacks. It also includes a volume control knob for setting up your desired volume for headphones or speakers. The sound card is compact in size but is very powerful. It supports both PC and Mac OS which makes it a great choice for most of the computer users. It connects using a micro-USB cable on the rear. You can also change or customize various audio settings and effects using the Sound Blaster Omni Control Panel software. Other features include Scout mode and CrystalVocie technology. So, if you are looking for a high-quality USB Sound Card for your laptop and PC then you should definitely get this one. Highly Recommended by me. 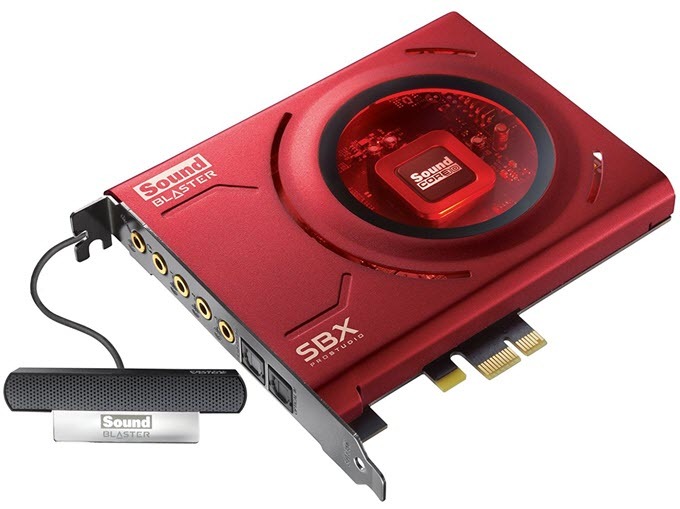 Note: If you want a plain 5.1 surround sound USB sound card without mic but with remote control functionality then you can get Sound Blaster X-Fi Surround 5.1 Pro. If offers the same performance as of Sound Blaster Omni Surround 5.1 and is a bit cheaper to. You can check both of them out from the links given below. 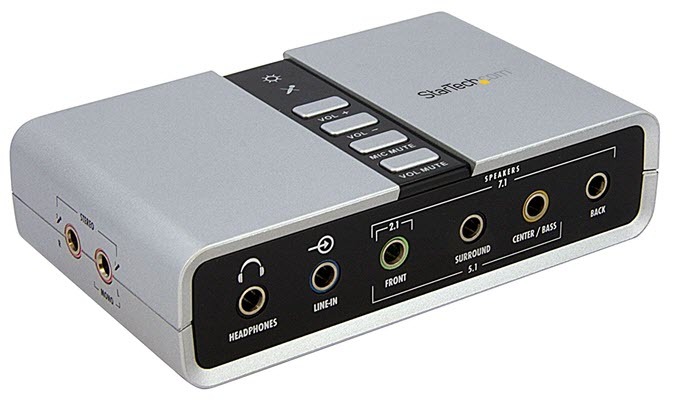 Sound BlasterX G5 is a high-fidelity portable sound card with 7.1 surround sound support. This USB external sound card delivers exceptional SNR of 120dB and HD audio quality up to 24-bit / 192kHz. It is powered SB-Axx1 multi-core processor for superb performance and sound quality. It includes two USB ports on the rear. One is micro-USB port for connecting to PC and other one is typical USB Type A port that acts as a passthrough for connecting small devices such as mouse, keyboard, USB drive. The sound card is compatible with gaming consoles and you can connect Xbox via Optical-in port and PlayStation 4 via micro-USB port. You can also record music or audio with low latencies using this sound card. This high-performance external sound card comes with 600 ohm amp for high-impedance headphones and a volume control knob to adjust loudness according to your desire. There is Red LED volume indicator around the knob that visually shows the level of volume i.e. how loud it is. It comes with BlasterX Acoustic Engine Pro software from where you can select various profiles and control & adjust settings and effects. The sound card also includes Scout mode for gamers. It works on both Windows and Mac OS and is compatible with Windows 10 too. So, if you are looking for the best external sound card with excellent sound quality and advanced features then you won’t find anything better than this. Highly Recommended for Enthusiasts and Audiophiles. I’ve read your article with interest regarding the various sound cards. 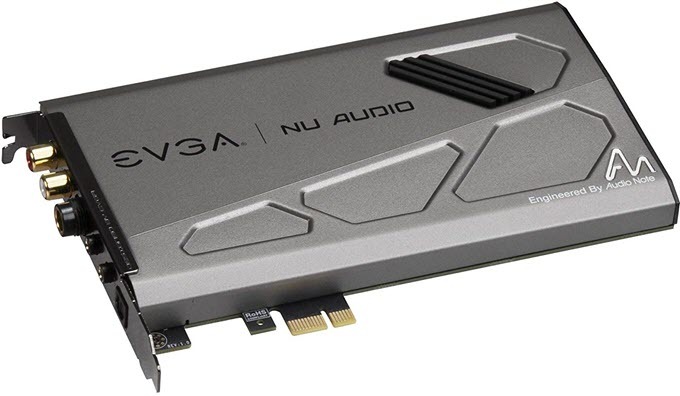 Where it differs from the others however, is that it’s the only one that I’ve come across so far, that includes in its comparisons, the new EVGA Nu Audio Card. I’m a great music lover, I’m not into gaming in any way, shape or form and lighting, well, if it’s not going to interfere with any music playback then fine. I guess you are a music enthusiast or audiophile and you will certainly notice a great deal of difference between any on-board sound and a good dedicated sound card. Also, even a mid – range headphone sounds great with a professional grade sound card. EVGA NU is a very promising product and has already received praise form all sides. I think it is worth the money if you want the best possible audio listening experience and in gaming too. So, I think it is a very good investment. Hope it helps! Thank you for you quick response. Do you believe the EVGA NU Audio Card would work well with my Sennheiser HD 598SE headphones, bearing in mind my love of classical music and especially opera? Thank you for your help on this. Don’t worry, it will work great.